If you're wondering how to lime wood for a white wash effect, you've come to the right place. Liming is a technique that has long been used as a finish on exposed timbers, flooring and furniture. Especially as sometimes after stripping an item, the wood revealed may be disappointing. This can be improved by applying a limed finish, which is like a white wash that will enhance the overall appearance of the wood while still highlighting the beauty of the grain. In this project, we lime a pair of timber doors, but the technique can be used on any suitable wood surface. Find more decorating projects and advice on our dedicated hub page. 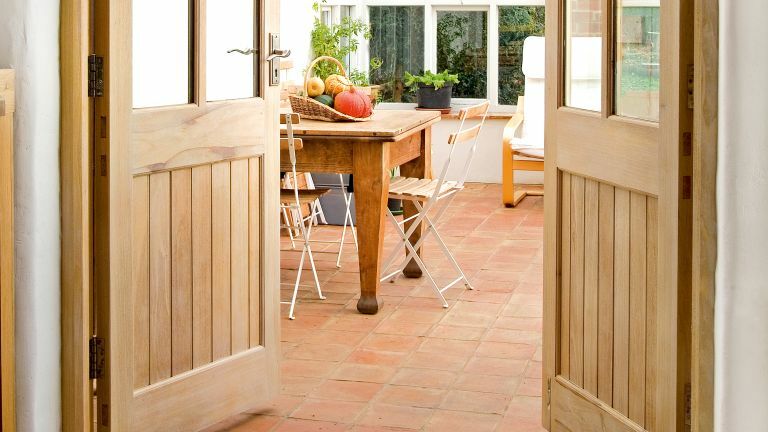 We've got everything from how to restore wood doors to how to restore old wooden furniture covered. Prior to applying a limed finish, wood must be clean, dry and grease-free, and existing finishes completely removed. It's also worth thinking about the type of wood that you're dealing with. When used on open-grained wood such as oak, chestnut and ash, liming has a pleasing effect, but it’s not so good with pine. Interesting lime effects can be created on soft woods that may be colour-washed or stained before to achieve more of a contrast. Or, you could mix pigment into the lime wax for even more distinctive effects. Bear in mind that, as well as being used on furniture, this effect can be used on wood flooring, too. Waxed wood can be scrubbed with a solution of hot water and strong detergent, rinsed with hot water and when dry, wiped over with a rag dampened with white spirit. If a chemical stripper or caustic bath has been used to remove old paint, ensure that it has been neutralised before you start. Scrub it with a solution of one pint of vinegar added to a bucket of clean water. Finally, take a clean cloth and wipe over with clean water. If there are any nail heads showing in the wood, knock them just below the surface and push the wood filler firmly into the holes leaving it slightly proud of the surface. Allow to dry, then smooth flush with glasspaper. To avoid unsightly scratches always sand with the grain. Fill any gaps that may detract from the finished look. To help raise the grain, new wood can be wiped with a damp cloth and allowed to dry. Take a bronze brush and rub vigorously following the direction of the grain. Some woods have a chemical reaction with steel so avoid using a steel brush. Fragments left can blacken the wood and disfigure the finish. We used some timber offcuts of the doors as test pieces to try out different finishes. You may decide to dye or stain the wood before applying the lime wax, or to add pigment to the liming wax. If you haven’t got any offcuts, test on an area that doesn’t show in the first instance. Vacuum the wood, adjacent areas and floor to get rid of any sawdust. Wipe over with a tack cloth to remove surface dust. Apply liming wax – we used Liberon Liming Wax – with a rag, working into the grain of the wood. This is best done with a circular motion or following the grain, depending on the type of wood. Applied to exterior wood, lime wax offers some protection against the weather and is believed to discourage attack from wood-boring insects. Inside the home, limed wood has mild antiseptic properties so was traditionally used for hygiene reasons. Take a cloth and rub hard to remove most of the excess lime wax lying on the surface. Keep changing the face of the rag as it becomes clogged with wax. At this point – to make the job less strenuous – we used various scouring pads along with towelling rags. A wad of hessian rubbed across the grain proved effective too. To remove the white haze that remains on the surface of the wood, apply a fine paste wax, such as Liberon Black Bison Paste Wax, with a clean cotton lint-free cloth. The wax should also help to protect the limed finish and provide good resistance to finger marks and everyday wear and tear. For a more durable, water-resistant finish, apply finishing oil to provide a protective coating. We used it on the threshold and applied liberally by brush. Leave it to soak in for 20 minutes, then wipe away any surplus oil – if left to congeal on the surface it will stay sticky and attract dirt and dust. Wait for at least five hours for the wax and finishing oil to dry. Take another piece of cotton rag and buff the wood to a soft sheen. A furniture brush is best for this if you are treating a large area. For ongoing care, wipe with a damp cloth to keep the wood fresh, and occasional waxing and buffing will restore the shine.